The great thing about the blazer is how much it can change up an outfit. They are perfect for spring – go blazer, tank and skirt/pants by day and take off the blazer by night for a more casual look. 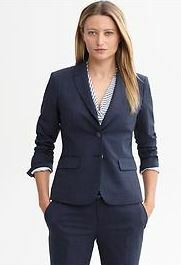 I recently got the Navy Lightweight Wool Blazer from Banana Republic ($198) for a work function. I paired it with a plain white tee from Banana, this yellow Mia Scarf ($49) from Banana Republic and the Circle Skirt ($79.50). What was nice is that I was able to wear the blazer the first half of the day, and as things warmed up, I was able to take the blazer off and the ensemble still worked! Use coupon code BR35TREAT for 35% off your entire order at Banana Republic today! I thought my blazer days might have been limited to that one event, but then I tried on another blazer last night at a CAbi party and was sold on getting another blazer! This is the Jacket du Jour blazer ($108) from CAbi’s spring collection and I can’ t tell you all how cute it was in person! It’s cropped a bit high so paired with a long cami underneath and it gave it a really great layering effect. I got it with teal-colored cami – such a great pop of color! I also saw it on a friend with a red cami underneath and that looked amazing as well. Also love the color of this Tinley Road Bleecker Blazer. Pictured in Coral it’s $69 – also love the Tango Red which is on sale for $49.99! And this is the Summer Jersey Blazer from Boden (on sale for $66.30) – nautical stripes are so trendy right now! 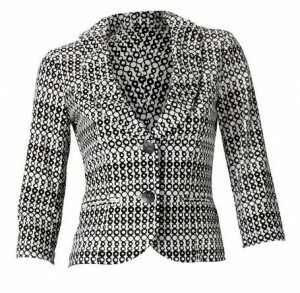 I absolutely love that blazer from piper lime! The color is perfect and so is the price. The Coral Blazer by Tinley Road from Piperlime is gorgeous. I can pair it with so many things – i love it.